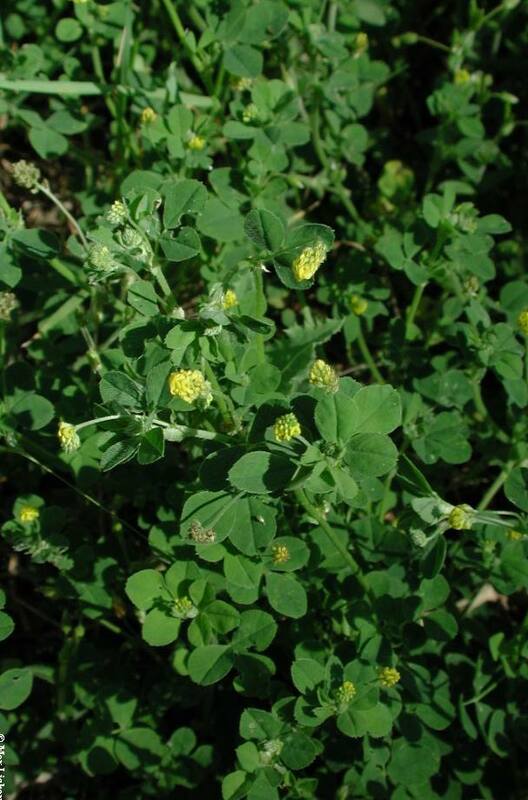 Reasons for concern: This plant is considered a nuisance in landscapes, gardens and fields. It can indicate low soil nitrogen. Its habit of growing close to the ground prevents the germination of native plants, and it easily outcompetes more desirable species, forming large, very dense colonies. Mature plants are very hard to pull. 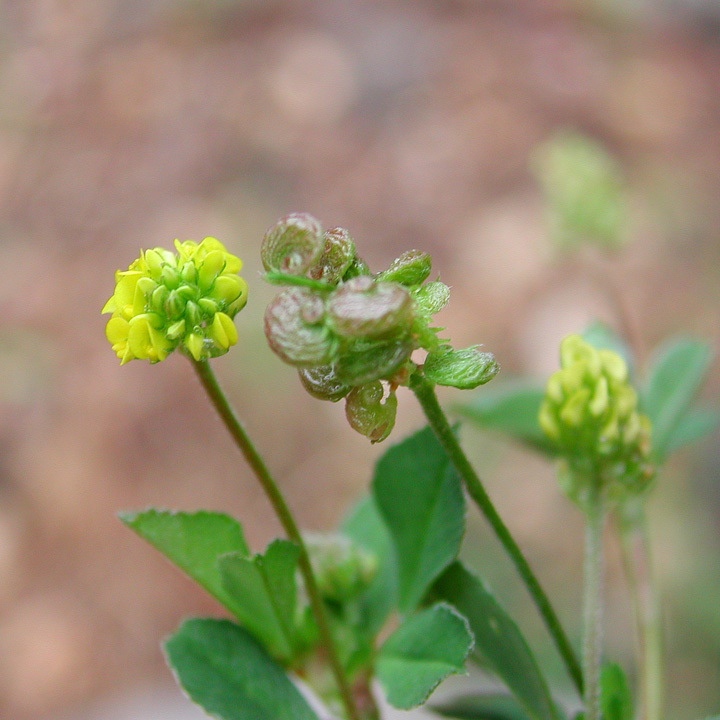 Botanical description: Low‐growing, spreading, broadleaf herbaceous plant. Leaves: Dark green. Three oval to heart-shaped toothed leaflets at end of short stem. Stem(s): Prostrate, trailing stems can reach 2 feet long. Sometimes grows erect. Flowers: Bright yellow, tiny ball, attached at end of short stem, blooming April to September. As many as 50 flower clusters on each plant. Seeds: Formed in small pods, which are kidney-shaped, curved, and turn black when mature. Roots: Taproot and very fibrous roots, making them hard to pull. Where it grows: Generally likes full sun. Roadsides, compacted soil, fields, lawns, waste areas, disturbed sites from 2,500 to 9,000 feet. Weedy characteristics: One of the first plants to grow in the spring, as early as March or April, depending on the weather. Flowering and seed production begin within 6 weeks after seedlings emerge. Therefore, this plant has a lot of time to produce seeds each season. Control strategies: Start monitoring very early in the spring and hand weed growth regularly before seed production. Preventing Black medic seed production is important in its control. Disturb the soil as little as possible when trying to remove the taproot and fibrous roots. Tamp down the soil to compact it to give invasive seeds fewer places to settle and germinate. This weed may be an indicator that the soil is compacted. Correct this by aerating and amending the soil. Mulching can prevent seed germination. Black medic doesn’t thrive in shade so planting taller plants can help control it. Repeatedly monitor previous infestations for new growth. Plant desirable native species to out-compete invasives.